My pup's name is Apollo. His sire is 125 lb give or take and mother is around 85 - 90 lbs. He is the pick of the litter (yes, I purposely picked him bc he was the biggest). I want a 120+ lb shepherd, but of course I love him unconditionally. He'll be 21 weeks in 2 days and weighs around 56-57 lbs and 23 inches at the withers. My boy Chance was 39.9 lbs at 4 months, 60 lbs at 5 months, and now currently 6 months and 8 days old and weighs 80.1 lbs. He gains about 20 lbs every month. I was told his dad was 105-110 I'm beginning to think Chance will be the same. The weird part is that he's lean, not fat, not even a pudge but he eats like a cow - 4 cups every day, maybe a can of wet food for a snack once in awhile. I also give him raw eggs and meat and the vet compliments his coat every time. I do go walking on a trail and take him to the park often to keep him in shape so I guess that helps keep him healthy and pooped out. I enjoyed reading your post about Apollo's growth, I have been asking people the same question as my boy is a little on the oversized scale. At 9 months he is 106.5lb and stands 68cm at the wither. He doesn't look that tall or that heavy but vet scales don't lie and three separate height measurements came up with 68cm each time. None of this is fat or sloppy, he is firm, athletic, exercises everyday and extremely agile, and fast but just solid and tall. At 9 months I know he hasn't finished growing but do not expect much more in the height department but he is yet to fill out so I expect him to tip the scales at 50 kg or 110 lb by the time he is about 10-11 months old. I can only guess what his mature adult weight will be when he has finished filling out. Apollo is now 9 months and weighed in at 95 lbs, and 27 1/2 at the withers. He is VERY athletic for his size and age. He can jump off the ground and has been able to outrun me since he was 7 months. This is an oversized GSD that would make a great stud. He is possessive of me and follows me room to room. He's in that stage where everything is his and must know what is going on in his surroundiings at all times. His brother Aurie is still 94 lbs, but grew taller at 26 3/4 inches. Aurie is larger bone with a wider head. He cannot jump as high, he's moreso of a landshark. By that. I mean he can run fast but cannot jump as well. He's still growing into his body. Another great guard dog. Hope these growth chart updates help everyone. I have a 3/4 rottie and 1/4 GSD and he is 5 months old and 8 days. He weighs 79 lbs. This dog has 80% the look of a German Shepherd. His weight is beyond normal as I have been told by many, however, he is in perfect health. I got Apollo weighed 2 or 3 days ago. 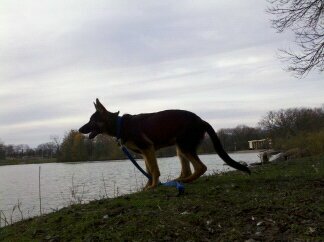 He is 7 1/2 months old, 26 1/2 inches at the withers, and weighs 86 lbs. He's getting big and his personality is maturing. He's quite the guard dog and very dominant. A lot of fine tuning is needed and will start obedience training in a couple weeks. He is very devoted to me and my girlfriend. His brother Aurie is 25 1/2 at the withers and 94lbs. Low prey drive and laid back, this pup lives with my parents. I will keep posting details on his growth process. Hope this information helps! Apollo went in for a 29 week (6 3/4 months) weigh in. He was 79.2 lbs today. One of his brothers lives with my parents, his name is Aurie. Aurie weighed 91 lbs a couple days ago. As for oversized GSDs... Like Anonymous said, they're not overweight. These types of shepherds come from the same litter as AKC GSD champions, they just come out bigger. Some GSD breeders breed to have bigger GSDs. Much like the Shiloh Shepherd. My breeder breeds for bigger but demands a sound GSD. It's pretty hard to breed an "overweight" GSD. That does not mean their "overweight" it just mean it's a large German Shepherd. My pup is 8 months and weighs about 70 lbs. His dad weighs 125-130 and that's one of the healthiest looking dogs I have seen. Hey guys, I just brought Apollo to the vet for a weigh in because we're moving to Illinois!! He's 25 weeks and 2 days old, and weighs 69.5 lbs and 24" at the withers! Thanks Shaun and Big Guy. I'll continue to post his growth on this thread throughout his growth process. Shaun, could you keep me posted on Jethro's growth? It would be nice to see Apollo reach 75 lbs. He'll be 24 weeks tomorrow. He's 64 lbs and 24" at the withers...maybe 24.5. That's awesome!! Make sure he is getting a balanced first class dog food or raw diet as you prefer. Watch his weight since GSD's are prone to hip and joint problems. You don't want to go through life with a dog in pain. Take care. Be proud. Happy Holidays!!! German Shepherds are not bred to be 100 pounds! They are working dogs and are not bred to carry that extra weight. Reputable breeders conform to the breed standards or exceed them. If you see a German Shepherd that weighs 120 pounds or more, most likely... it's overweight. Your GSD looks and sounds about the same as my Jethro. At 6 months old Jethro was 75 lbs. He is now 8 months old and about 100 lbs and still growing. Apollo turned 22 weeks yesterday. 59.0 lbs and 23.5 inches at the withers.